This chuck sleeve is extremely easy to make. You simply turn a 'bowl' with a stepped inside. 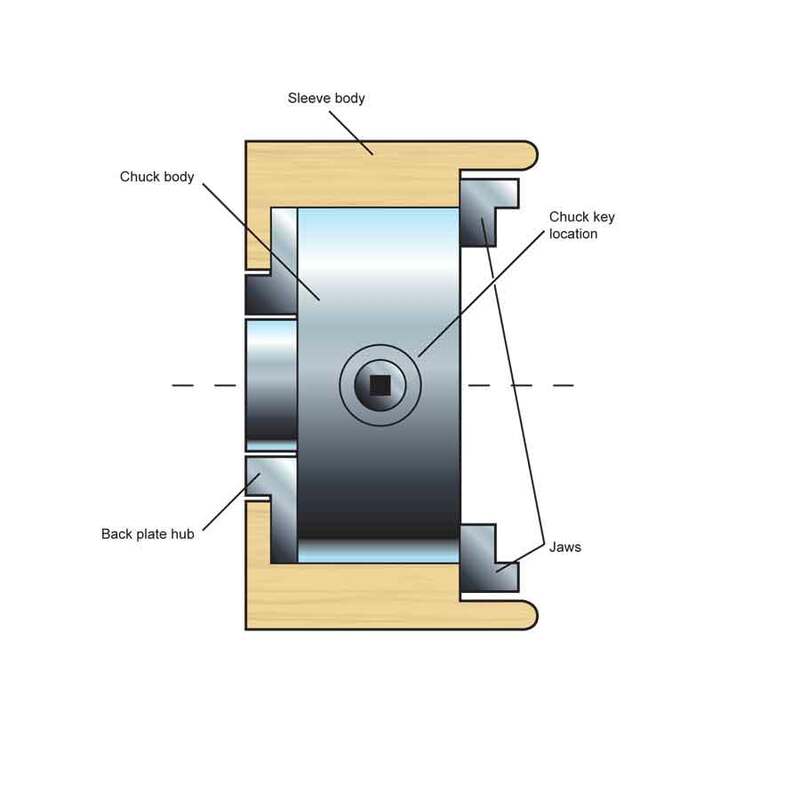 The smaller diameter is the same as the outside diameter of the chuck. The larger diameter is the distance between two opposite jaws when extended to its safe maximum travel. For the chucks I use, the measurements are 98mm and 110mm, respectively. 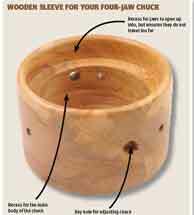 The outside diameter of the 'bowl' is 126mm. 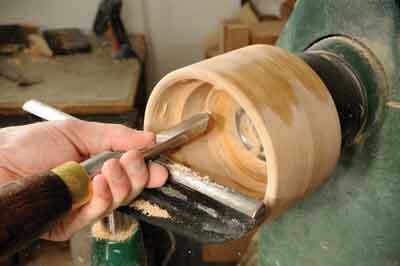 The bowl is just deep enough to contain the chuck and the diameter of the opening in the base and should be a good fit over the hub of the back plate. The thickness of the base is very critical. When we mount the chuck on the lathe spindle, the back of the back plate hub screws up against the shoulder of the main spindle. The two surfaces should meet perfectly - this makes the chuck run true. 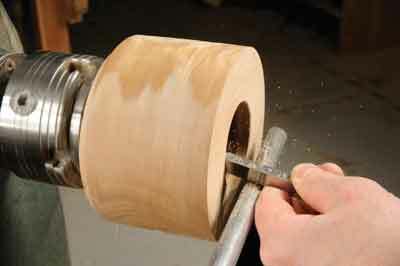 If the bottom of the sleeve is too thick, it will stop the chuck being mounted safely and truly. When the whole assembly is satisfactory, you drill two holes in the side of the sleeve for the chuck key. The drawing opposite gives an idea of the general arrangement. 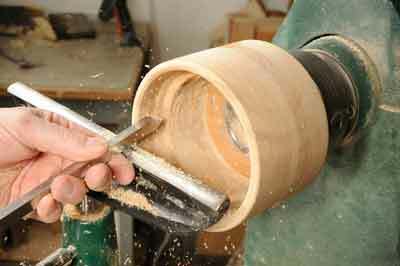 When I bought my first lathe in 1959, woodturners did not use chucks. 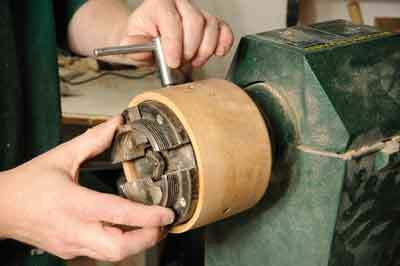 Chuck design for woodturners evolved over the last 30 years. It started with numerous variations on expanding collets, using rubber bands and spiral springs, and interestingly, it finished with the adaptation of the well-established engineering chuck. Scroll chucks, on the other hand, have been around for over a hundred years. 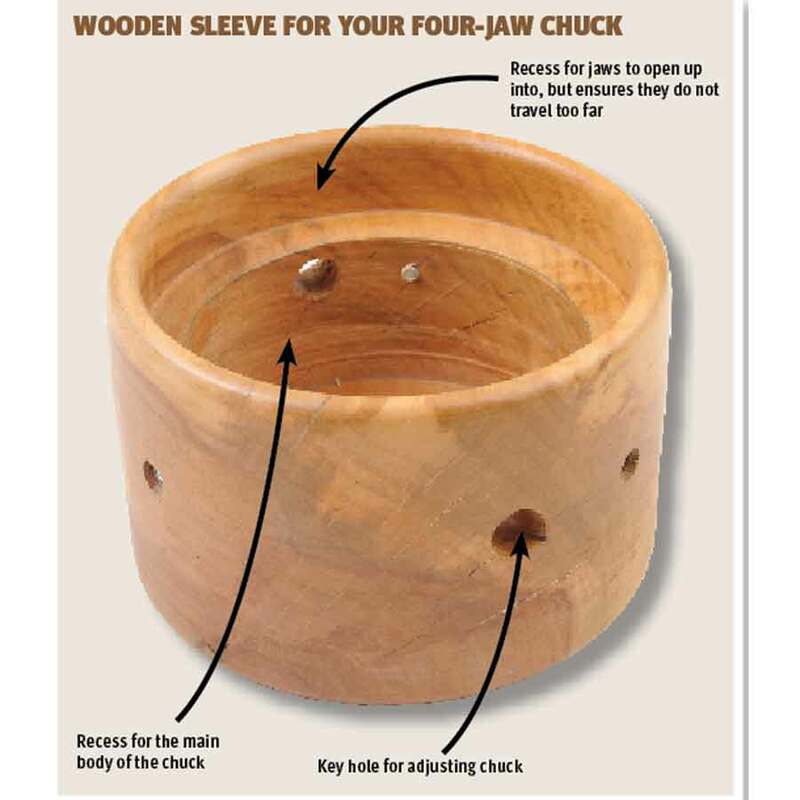 Woodturners often start their turning with a square piece of wood, hence four-jaw chucks became the industry standard and came up against the three-jaw version, which is common in metal turning. Lathe operators are all too familiar with the possible problems associated with the over-opening of jaws. Most manuals warn the user to not open the jaws too wide. If you do, the jaws projecting outside the chuck body can cause an accident or can even fly out of the body, thus causing serious injuries. Chucks can be very dangerous if misused. I have seen the cast aluminium nameplate from a Graduate lathe, which was broken into two pieces by one segment of a Cole jaw, which flew across the workshop. 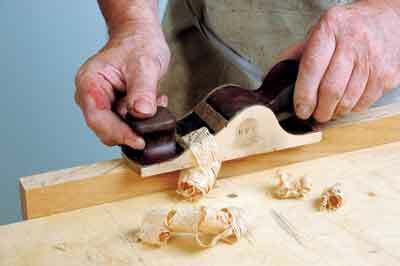 Most new chuck designs limit the amount of travel within safe limits to prevent the jaws from coming out of the chuck body if extended too far, but will not necessarily stop the jaws, which although stopped in their travel still extend from the chuck body and can do damage to hands and knuckles if you aren't paying attention. 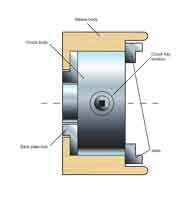 If you are concerned about this issue with your older type four-jaw engineering chuck, you might like to consider turning a wooden sleeve which will render your device safer without compromising its use.